Includes product comparison tables for oscilloscopes, function generators, power supplies, counters and digital multimeters. 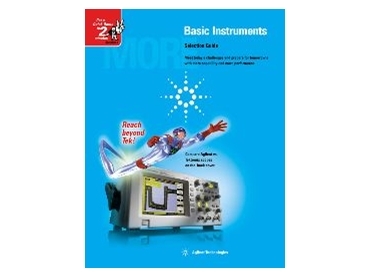 AGILENT Technologies has released a basic instruments selection guide. The 20-page guide includes product comparison tables for oscilloscopes, function generators, power supplies, counters and digital multimeters for easy evaluation and selection. The new Agilent 3000 series oscilloscopes are covered. Agilent Direct enables engineers to build side-by-side product comparisons, and Quick Quote, a Web-based 24/7 order quote system, has Agilent benchtop test and measurement instruments. The guide is available at http://www.agilent.com/find/catalog. Additional information about Agilent Direct is available at http://www.agilent.com/find/agilentdirect.